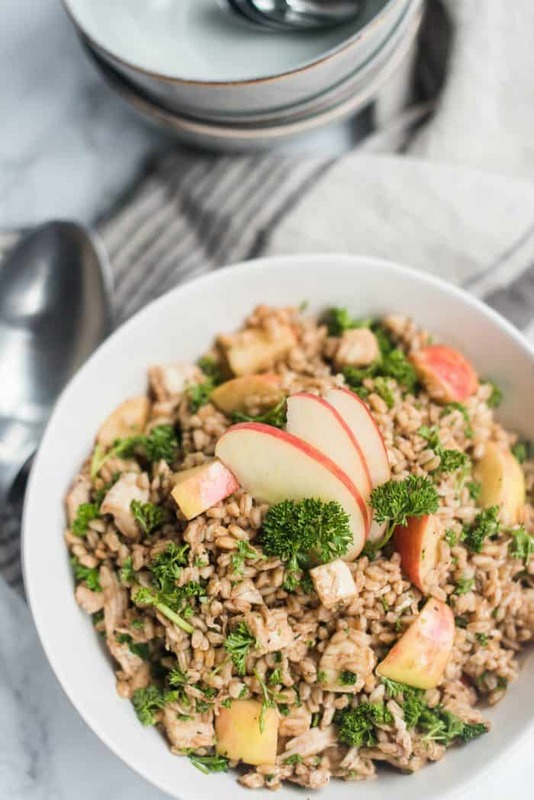 This Farro Apple Mozzarella Salad is a healthy recipe made with grains, fruit, cheese, and a light lemony dressing–perfect for lunch or a side salad! October is one of my favorite months. Not only for delicious, hearty salads, but because there’s just a special “feel” in the air. I don’t know … maybe it’s a hominess, or a warmth, or a togetherness that makes our hearts so thankful. 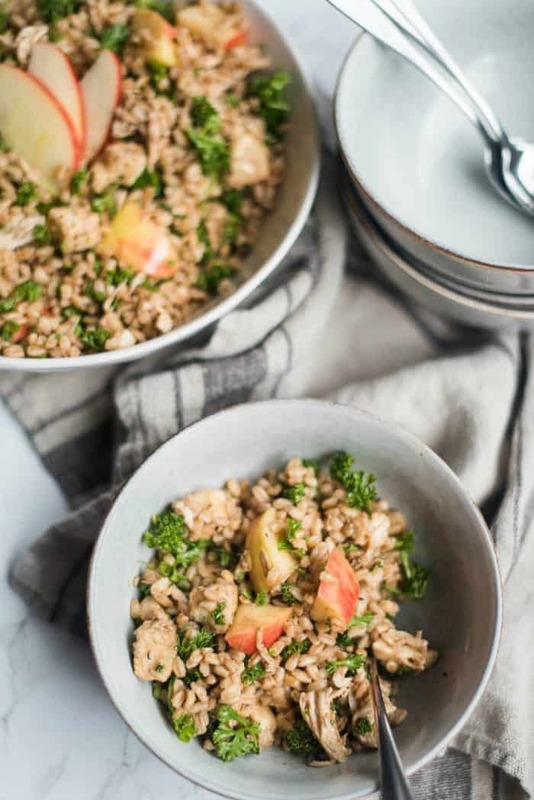 Or cozy salads (with grains) like this Farro Apple Mozzarella Salad! 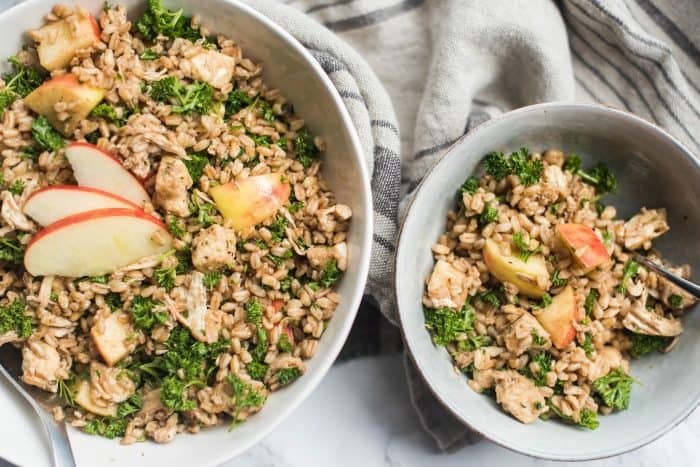 It’s nutty, salty, and sweet with the apples. My favorite kind of salad. Add in a soft mozzarella cheese, the kind that you would have in a Caprese salad, and fresh herbs. 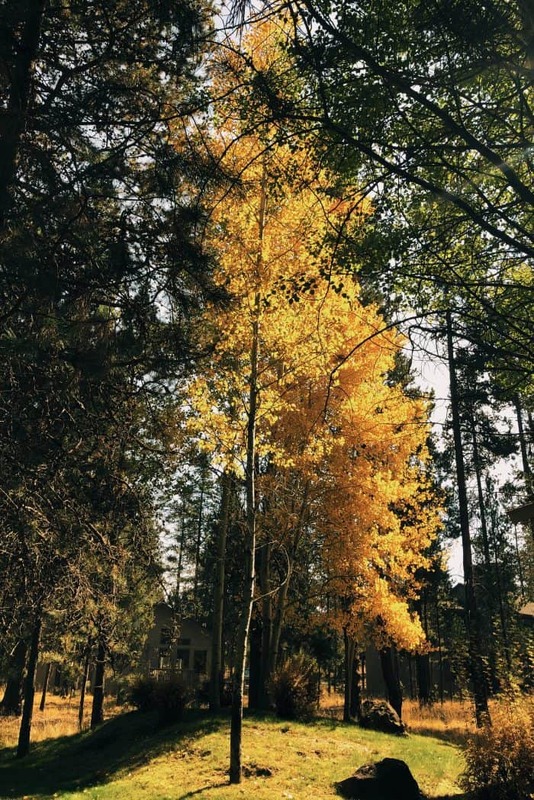 Even though it’s a busy time for my husband and me, with lots of travel, we’re grabbing up lots of beautiful walks, and taking advantage of the shorter days, with more cozy evenings together. The beauty of nature. A sweet reminder of God’s love and grace that carry us along, without the conditions and proving, errors in our ways, or grievances. At the end of the day, that is enough for me. 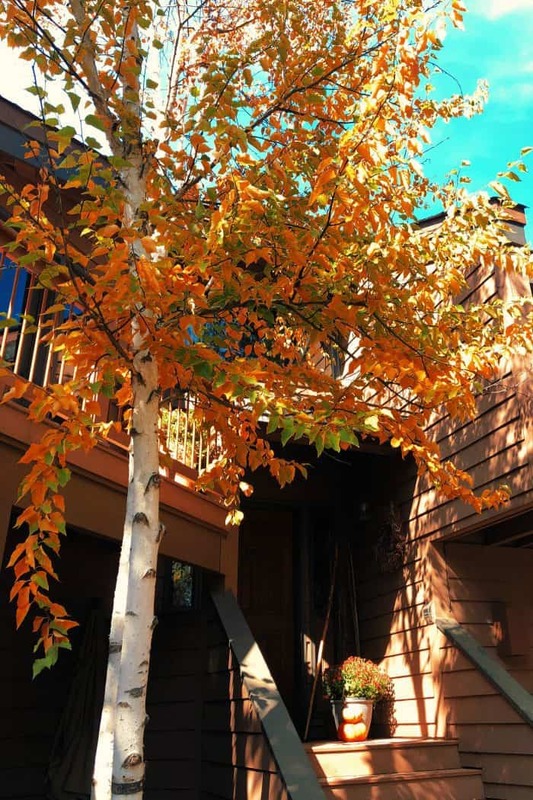 Our mountain home experience has been a sweet, well-connected way of living for our family. It’s been different a different lifestyle, but healthy and good. It’s made us stronger, and wiser, and we’ve learned to work smarter together (in a small space), and … love each other more. When we begin the day recognizing our blessings, we are changed! 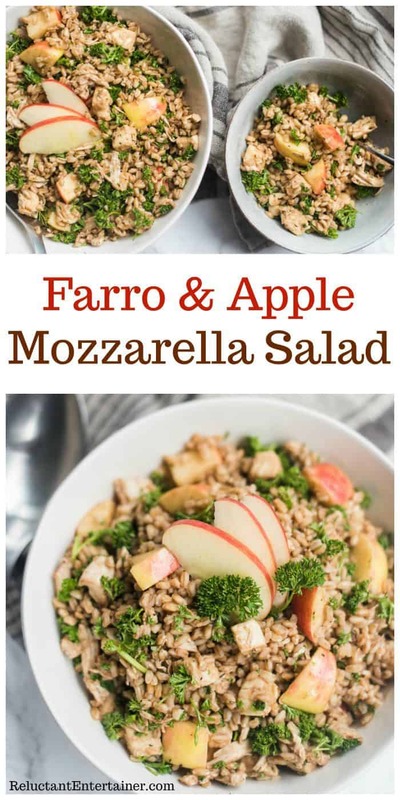 We love healthy recipes made with grains and fruit and cheese, and this past week I made a scrumptious Farro Apple Mozzarella Salad for the family for lunch. Let’s just say, I did not make enough! 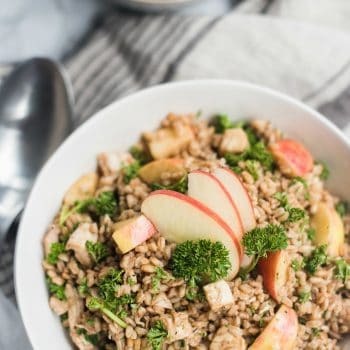 I buy farro at Trader Joe’s, and for awhile it was like the new kid on the block here, after quinoa made its big splash in the world. But really it’s so common now, you can buy it anywhere! It’s a type of wheat berry, and is stocked in most grocery stores. And with crisp apples and rotisserie chicken? So good! 1. Make salad: Combine 1 qt. water, the farro, and 1 1/2 tsp. salt in a 3- to 4-qt. saucepan. Bring to a boil over high heat, then cover, reduce heat to low, and simmer until farro is tender, 25 to 30 minutes. 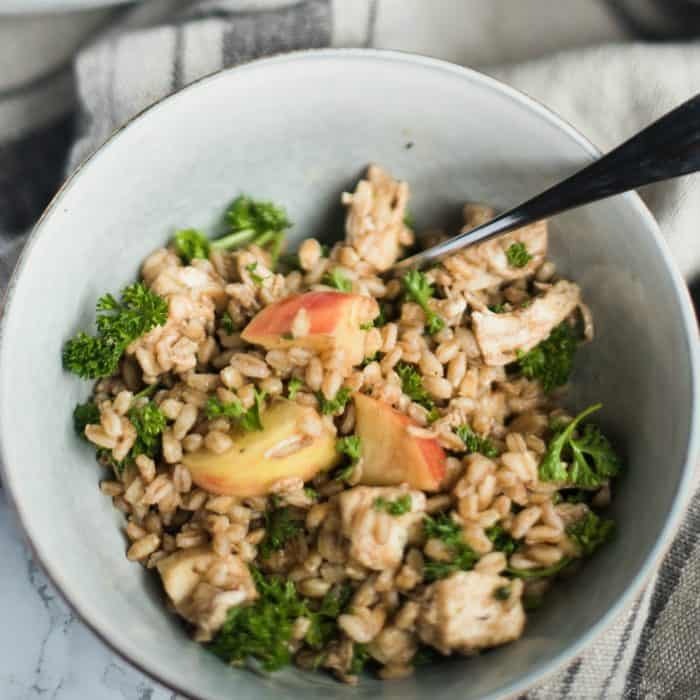 Drain farro and spread on a baking sheet to cool and dry at least 5 minutes. Transfer to a serving bowl, add parsley and thyme, and toss to combine. 2. Make dressing: In a small bowl, whisk together lemon juice, honey, shallot, and salt. Whisk in oil in a thin stream. Pour over farro mixture and toss well to coat. 3. 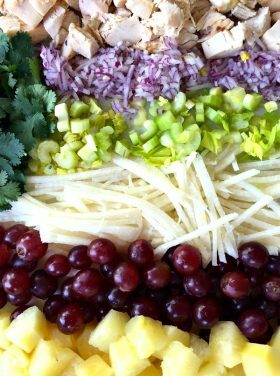 Cut the cheese and apples and chicken into small chunks. 4. Mix together. Add the dressing; toss and serve. 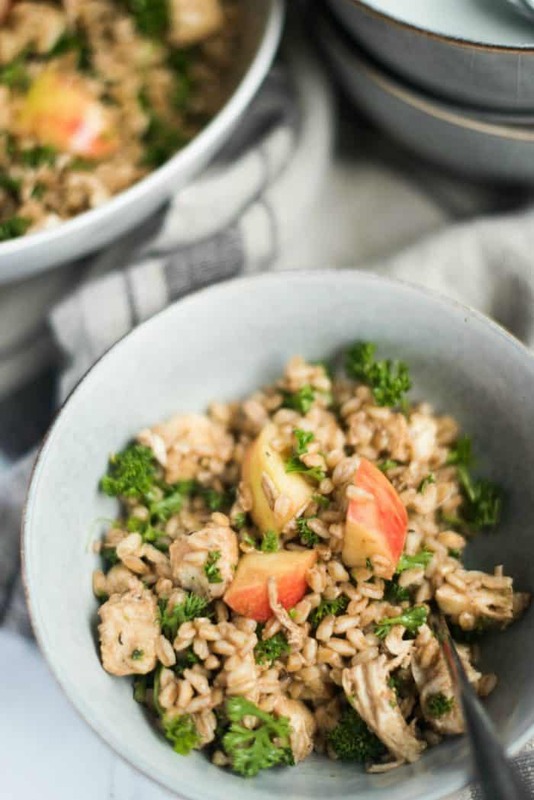 More farro recipes: Instant Pot Chicken Stew with Farro [Cookin’ Canuck], Farro with Mushrooms, Thyme, and Balsamic Vinegar [Kalyn’s Kitchen]. 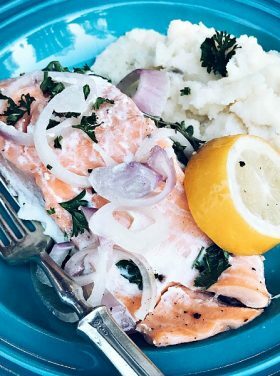 Hey, Sandy, I really enjoy your blog and tasty/do-able recipes. 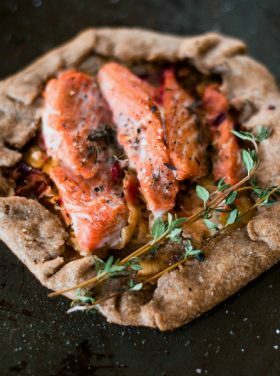 I want to make this recipe when my daughter visits, but am a little confused about the ingredients. I think maybe some of tbe dressing ingredients ended up in the main recipe, causing the instructions to be confusing. If you have the time, could you please clarify? Thanks very much! Thanks for a great recipe. I made this for lunch today and it tasted delicious. I love your spirit so much and can feel your homesickness. I miss my family for many reasons, too, and hope to do some visiting soon. I recently read a wonderful essay about the deep value of living in close quarters (small house) with loved ones. It was such an inspiration. Much love to you and enjoy getting ready for our milestone anniversary trip!! Yum. Pinned this to try later.